Since 2004, MSG became a wholly owned subsidiary of Nippon Sheet Glass Co., Ltd when the latter acquired the 51% equity from the local shareholders. 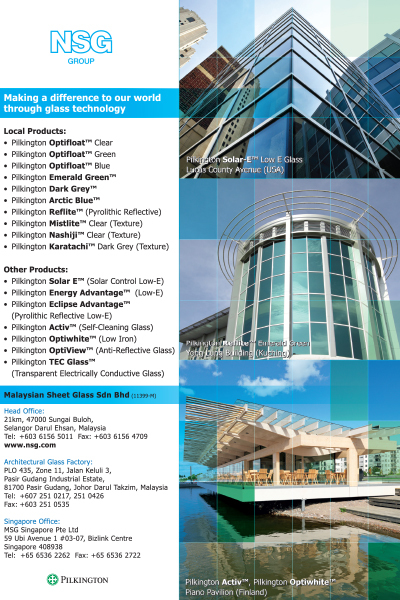 In June 2006, Nippon Sheet Glass Co., Ltd acquired a 100% stake in Pilkington plc for US$5.2 billion. As a result of this acquisition, the NSG Group is now the world’s leading manufacturer of products ranging from Energy Savings Glass for Architectural use to Specialty Glass for Information Technology and Fiber Glass use. Copyright ©2002-2011 Pertubuhan Akitek Malaysia.